Kofi Annan has said: “Founded on the principles of private initiative, entrepreneurship and self-employment, underpinned by the values of democracy, equality and solidarity, the co-operative movement can help pave the way to a more just and inclusive economic order.” This quote outlines the opportunities for the co-operative movement as a source of empowerment for people as well as its underlying principles. The history of the cooperative dates back to 19th century Europe, mainly Britain and France. It is not new, and it has a rich history as well as a variety of examples, with differing levels of participation. Cooperatives are attractive, because they are appealing – they bring the idea of participatory democracy to the workplace. They are a strong example of how a mainly economic enterprise can be tightly linked to a democratic practice. This article addresses the role and opportunities for the cooperative in the 21st century. An interesting research in this area was published in 2010 by The Community Inventors Lab, which is a part of MIT’s Department for Urban Studies and Planning, the name of it “Sustainable Economic Democracy: Worker Cooperatives for the 21st Century”. The paper examines two examples of cooperative practices – Mondragon in Spain and Evergreen in the US. The central idea of the paper is the importance of economic democracy, meaning that “local economic institutions are democratically controlled”. Economic institutions include such sectors as businesses, finance, research and development, as well as education. The road to economic democracy can be achieved through cooperative ownership of the local economy by those who participate, which in turn helps to root the wealth in local communities and prevents resources from going somewhere else. There are different types of cooperatives and this article focuses on the idea of the worker cooperative. Workers’ cooperatives still operate for business interests and capital investment is still relevant, however workers’ are involved to a much higher degree and the focus is on cooperation among them. Even though the profit making motive does not leave the enterprise, the involvement of the workers allows for a balance, workers’ interests get taken into consideration. However the report does point out that the successes of cooperatives have been varied, but that does not mean we should not at least discuss their potential. Also it is pointed out that worker cooperatives can operate in a larger network, rather than as separate entities that most probably will suffer in the competitive global market. The two examples examined in the research provide valuable lessons for the future of the role of cooperatives in a 21st century democracy. For example, Mondragon in Spain developed into a cooperative group, where different cooperatives were working closely together, it allowed for a sharing of a governance structure, pooling of profits and losses and allowed for the movement of worker-owners among different member firms of the group. The approach of Mondragon includes 4 elements to creating a cooperative group. The elements are primary cooperatives, secondary cooperatives, spin off cooperatives and lastly the cooperative group. The primary cooperatives are created in the most important sectors, such as industry and retail. The secondary cooperatives along with the spin off ones are created to support the primary ones and expand the network. Lastly the creation of a cooperative group allows for risk and resource pooling, as well as increased mobility. In addition, it is important not to forget that these cooperatives were established in different sectors, such as industry, retail, finance and education. This strategy of diversification allowed for Mondragon to remain competitive. The ability to move between different cooperatives allowed for flexibility and in a growingly competitive market, this is of importance – the ability to adjust and learn quickly. The amount of different cooperatives allowed for one to produce what the other ones could not and exchanging amongst themselves and thus eliminating the need for importing things. Of course, there are those, who argue that each case is unique and successes cannot be replicated one to one, but certain lessons do appear. For example, the necessity for an interconnected network and a diversified approach. One must also remember that the model of Mondragon was developed over decades and this kind of a strategy requires long term planning. The Evergreen enterprise took the example of Mondragon, but adjusted it to their own specific circumstances, focusing on one central local institution and branched out from there. Different cooperatives are responsible for different aspects, the same as in Mondragon – one for finance, one for leading, another for funding and lastly one that is responsible for governing. So it adjusts the model of cooperative networks for its own internal needs. Lastly the research outlines the values that should guide this kind of an approach – a strong, but democratic leadership, values of local ownership and solidarity, education as a tool for expanding networks and lastly cooperatives as organizing entities that help to organize people according to common interest, transcending, for example, racial or ethnic divides. There are millions of people working in cooperatives in the 21st century, however, it is sometimes forgotten that they in effect are democratic entities. Maybe something can indeed be learned from these two examples. Because democracy is about people getting involved and where is it more appropriate than in the workplace, where many of us spend our daily hours? It is about having a stake and thus an interest into what happens to you in the workplace, as well as to your colleagues. Nicholas Iuviene, Amy Stitely, Lorlene Hoyt, „Sustainable Economic Democracy : Worker Cooperatives for the 21st Century,”The Community Inventors Lab, October 2010, p 5. Nicholas Iuviene, Amy Stitely, Lorlene Hoyt, „Sustainable Economic Democracy : Worker Cooperatives for the 21st Century,”The Community Inventors Lab, October 2010, p 26. THUNDERCLAP – Is “the louder, the better” when it comes to social activism? What is Thunderclap? Thunderclap is the world’s first ever crowd-speaking platform. It significantly increases the social reach of campaigns by posting the same message from many social media accounts at the same time. In terms of numbers, Thunderclap has launched over 3 million campaigns since 2012, reaching more than 3.5 billion people in 238 countries. Mainstream campaigns are mostly about civic activism and charity. Initially a project within the global advertisement giant Droga5, Thunderclap eventually evolved into a separate company; today it counts with a tiny but “thunderous crew” based in NY. To create a Thunderclap you just need to visit the website, connect with your social media account and invite followers to support your cause. If you reach the pre-set number of followers within the deadline, the message is sent from all the accounts simultaneously. Basically, anyone can create a Thunderclap, it is free and easy to use. Behind some of the most successful campaigns are brands and creative business, institutions and governments, like the White House, the UN and the UK Labour party, but also ordinary people with great ideas, like Dutch designer Dave Hakkens. The largest campaign in Thunderclaps’s history, #Phoneblocks calls for awareness over e-waste by launching the idea of a phone designed to last for a lifetime- the separable blocks which make the phone can be easily substituted when they stop working. However, the site also offers different customised paid plans to maximise the campaign’s reach and some worry that Thunderclap might be heading in the wrong direction and become just another advertisement tool. Notable brands like Discovery Channel, BBC, Durex and Levi’s have used the platform to advocate for relevant causes, like HIV, the extinction of sharks and the right to education. On the other hand, Thunderclap has also lent his voice to less charitable causes. For example, it helped generating enthusiasm before the revelation of 2012 People (magazine) sexiest man alive. 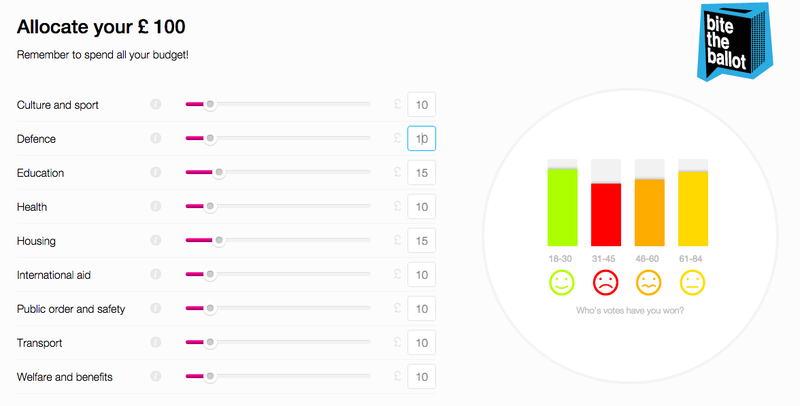 Still, Thunderclap’s team insist that the most successful campaigns are the ones related to social activism because they connect people to a cause emotionally and, for now, numbers tell the same story. There are some practical downsides as well. In order to support a Thunderclap people need to connect to the platform via other social media, like Facebook or Twitter, and especially be willing to give consent to Thunderclap to post on their behalf. Besides, timing is crucial. The “all-in” philosophy of Thunderclap means that if your Thunderclap fails to reach the target of supporters, it is as if it never existed. None of the donations are received by the organisers. Plus, if your message does make it to the walls of millions, you still have to take into account that only reach those who are connected at that moment. But what we really should be asking ourselves is this – is louder really better when it comes to social activism? It can be a double-edged sword. Most certainly there is the danger that engagement to campaigns is only temporary and superficial. Let’s not forget that Thunderclap reaches friends of friends on social media. Some may share just because it is cool and then forget about it. Once the Thunderclap is sent out, the campaign is considered “completed” and people move on supporting other things while much more needs to be done to operate change for real. Another way to find an answer to this, is try assessing the impact these campaigns have had. Not an easy task for, unlike for example change.org, Thunderclap is designed to spread a message, rather than achieve it. Thus far, Thunderclap’s case studies only measure campaign’s effectiveness. Besides, it is too early to tell whether the campaigns have the potential to determine change. The phenomenon is recent and many factors come into play. Yet, one way to quantify the impact more concretely is to have a look at the role of social media in allocating donations for non-profit organisations. Donations to non-profits have achieved change in some instances. A survey performed by the 2014 Case Foundation found that even though emails and websites still rule as tools of engagement compared to social media, the gap is closing. Social media is growing 3 times faster than email. All things considered, the social media storm can create an invaluable window of opportunity. It is thanks to Thunderclap as well if Motorola, Sennheiser and others are working on prototypes of the #Phoneblocks right this moment. Let’s think twice before disdaining social media activism so easily precisely because it is social media, hence, no place for “serious discussions”. It would be great if more people used it this way! By capitalising on today´s dependence on social media, Thunderclap is a creative way to involve people- especially the youth- into civic activism and social responsibility. Thunderclap is not perfect, but it can be a significant push in the right direction. Ultimately, we cannot always expect a software to do it all. For most young people politics has never been a hot topic. A 15-year old Briton named Jeremiah Emmanuel said that before he took an interest in government to him it was just “a room with green seats and a load of men shouting at each other,” and sadly these kinds of statements can be heard from young people everywhere. It should be no surprise than that the youths involvement in politics is meager at best. Take Britain for example, in the 2010 general election, only 44% of people aged 18-25 voted, compared with 65% of people of all ages. And while young people might not know it, the consequences of their detachment can have a considerable impact on their everyday life. The most vivid example is the coalition governments decision after the 2010 election to increase tuition fees, which was seen by many young voters as a betrayal by the Liberal Democrats who just months before had signed a pledge vowing to vote against any such increase. It is events like these that lead to young Brits becoming frustrated with politicians and discouraged to participate in their countries decision-making process. That is why democratic youth organizations that mobilize the young voter are becoming evermore important and one of these organizations is called “Bite the Ballot”. Based in the UK, “Bite the Ballot“ is a non-partisan movement which empowers young people by educating them on government and encouraging them to cast their vote. Formed in April 2010 by a business studies teacher David Hughesman and Michael Sani,, “Bite the Ballot” does not lecture young, potential voters with the old argument “if you don’t vote, don’t complain” but rather shows them that they have the power to actually change things. The youth organization is able to appeal to young citizens by employing modern technology and demonstrating their own credibility and understanding of the subject. By explaining the primary functions of lawmakers in an engaging way, “Bite the Ballot” changes the way that young people look upon politics and politicians thus encouraging them to vote. This is most evident when playing the online game called “#TheBasics”, where young people are put into the shoes of the lawmaker and tasked with setting Britain’s budget. At first the player has to allocate £100 across key areas and then, due to a crisis, revise his spending and cut £25. In addition to this, the player is shown the consequences of reduced funding in a certain area and how people from different age groups will respond to his decisions. For example, if you were to decrease education spending, you would see a decline in the approval rating among young citizens as well as the amount of teachers that will be laid-off because of the cuts. The lesson – politicians cannot please everyone, all the time. “Bite the Ballot” wants the player to understand this because it goes to show that sacrifices have to be made for the greater good and lawmakers are the ones making these tough decisions. It teaches the player that when it comes to politics, expectations have to be managed, otherwise politicians will always let you down and as a result you will distance yourself from any kind of involvement. In Britain this is a core problem because political parties are the top most hated brands, especially amongst young people. For instance UKIP, a political party, was cited by 58% of 18-to24-year-olds as the brand they most hated, closely followed by the other major political parties. However, “#TheBasics” does more than inspire empathy. 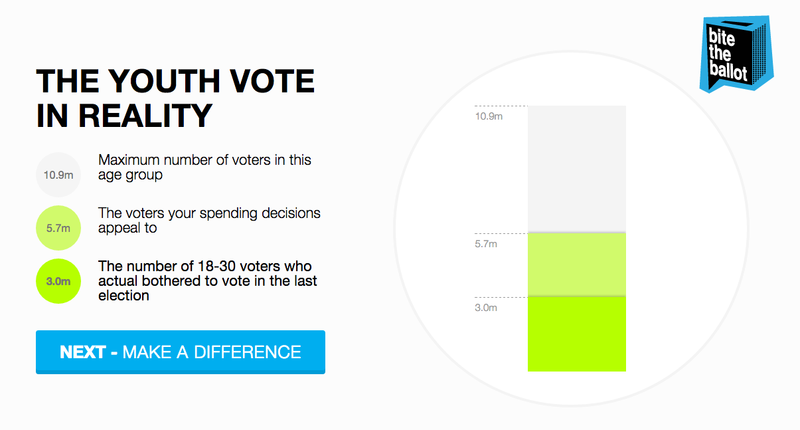 The main message comes at the end of the game when a bar chart appears and shows the maximum number of young voters in the UK (10.9 million), the number of young voters that actually bothered to vote in the last election (3 million) and the number of young voters who would support the players spending decisions. The trick is that even if the player made a perfect budget that was supported by all 10.9 million young voters, only 3 million would cast their ballots and try to put him back in office. Now, the player asks himself: “why did I even try?” and for young citizens, this realization is crucial. It explains why in the eyes of politicians they are more or less expendable, and makes them understand that this can only be changed by showing up on election day. It also appeals to an especially important aspect of a young persons life – independence. Rather than using the old argument “if you don’t vote, don’t complain”, “#TheBasics” shows that if you don’t vote, you don’t matter. This gives the player an actual incentive to go and vote, because it will show that he is capable of deciding what is best for him and his community. However, if he stays home on election day, he is allowing others to determine what his life should be like, and there is nothing that a young person hates more than being told what is best for him. But “Bite the Ballot” does more than encourage young voters to vote. It also provides credible and easily accessible information about political parties and their agenda, in a way that is captivating to the young audience. The perfect example is the recently released digital tool “Verto”. “Verto” is the worlds first voter advice application for young people created by “Bite the Ballot” and “Demos”, a cross-party think tank. It matches a person’s beliefs with the policies of different political parties, by analyzing their responses to statements about multiple issue areas such as jobs, healthcare and the economy. For young, inexperienced voters this is helpful because from their perspective the landscape of modern day politics is extremely complicated. A lack of political schooling, confusing, oftentimes impartial media coverage and convoluted speeches given by politicians are the main barriers that prevent young citizens from fully understanding each party’s agenda. As a result they are less likely to vote, and more likely to make an ill-informed decision when voting. That is why “Bite the Ballot” focused on two things when making “Verto” – simplicity and credibility. By working with focus groups all through development, “Bite the Ballot” has ensured that the app is simple, fast and intuitive which is incredibly important if your target audience are young modern-day citizens whose attention is hard to grasp. Therefore, when using “Verto” it does not feel that you are using a complex political tool, but rather a lifestyle app which tells you which restaurant is most likely to satisfy your wants and needs. To ensure that the information about each user’s beliefs is accurately analyzed and matched against a political parties agenda, the youth organization researched statements, speeches, policy documents and even hosted a 10 person academic panel in association with the political studies association. After that they presented their arguments to policy managers from all 7 parties to ensure that their agendas are accurately presented. It’s this kind of social responsibility and innovative thinking that convinces young people that participation in their countries decision making is easier than they thought. “Verto” and “#TheBasics” might seem like small projects, aimed at mobilizing young voters, but they are a part of something much bigger – a change in how citizens involve themselves in democracy. Politics is the last frontier in civil life which has not experienced a surge in technological innovation and now that is changing. With only an internet connection, people can access digitalized tools such as “Verto” and “#TheBasics” and learn about the intricacies of government. As these applications develop, the social mobility of citizens will increase exponentially and the disconnect between the voter and the politician will decrease. Young people will be at the forefront of this and they will be the ones to change the way future generations look upon politics. That is why organizations such as “Bite the Ballot” are so important. They shift the narrative and teach young people that participation and social responsibility are the cornerstones of any democracy. In the post about European Parliament elections we talked about how online platforms help to make European politics more comprehensible and engaging. However, the roots of any position of a political party or MEP – be it national or European – still lies in that uneasily definable space of news, opinions, commentary, trends which constitute a public debate. In other words, it is difficult to have politics without a space where those different positions are established in the first place and which then are crystallized into concrete political decisions. It also highlights the issues that are of most concern to the particular society. Europe is said to have limited space for such debate, as reasons accounting lack of common language, institutions (e.g. European media) as well as the fact that the citizens’ deepest interest and understanding belongs to national politics. Can the online platform Debating Europe, which allows anyone to start a discussion on basically any topic as long as it remains connected with Europe, be a significant step in the direction of creating such space? Idea of how Debating Europe works is quite simple: anyone who is interested and has prepared a question or comment that has significance in European context can submit it in written form or via video message. Then ‘’Debating Europe’’ team takes up a pertaining question and reaches out to politicians and experts that are associated with this particular issue. Sometimes publicly heated topics are first posed in the platform for users’ response, most popular are then taken for policy-makers and experts to discuss. In the result, the impetus given by any platform user can be developed in a full-scale debate where the opinions of different sides are introduced, creating better insight into a particular matter and giving more solid base for further discussion in the comments section. Themes that have been discussed in ‘’Debating Europe’’ are very diverse and it shows that European public sphere can be very much alive as there are so many aspects – political, social, economic, environmental, ethical, and cultural – to be examined in reference to the communal life of Europe. One of the recent examples concern the Greek economic crisis and the referendum in which the Greek people voted ‘’no’’ to the debt refinancing plan prepared by the European institutions and the IMF. This event sparked a serious debate about the member state’s sovereignty and the rules of the EU as a political system itself. 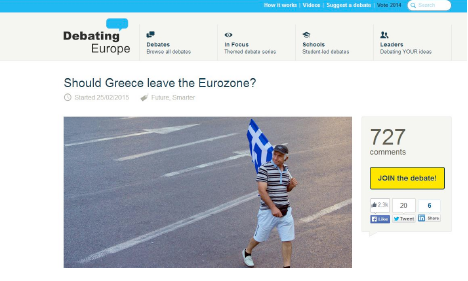 ‘’Debating Europe’’ has closely followed the developments of the Greek debt crisis, inquiring its users about its possible solutions, heeding on the conversation whether the Greek debt should be forgiven as German debt was in 1953 (attracting great interest by the users which posted more than 1500 comments in response), asking should the Greece leave the Eurozone. Here, for example, their differing opinions expressed Manfred Weber, a MEP and Chair of the centre-right European People’s Party, American economist Barry Eichengreen as well as Stelios Kouloglou, a MEP from the Greek governing Syriza party. There were several other discussion threads about Greece which all were very actively received by the users, and presented both viewpoints of experienced observers and participants, both opinions of ordinary people across Europe. On ‘’Debating Europe’’ radar are various issues, and the most acute political issues are just a part of them. One of the more sociologically reflective debates that highlighted the gap between expectations and reality in the former Soviet bloc countries was dedicated to a theme-debate series ‘’25 years after the fall of the Berlin Wall’’. Debate Have living standards in Eastern Europe decreased after Communism? was initiated in response to the comment of one of the users Hrovje who argued that ‘’Life in many former-Communist countries is worse than 25 years ago, especially countries in Eastern Europe and the Balkans. They have many social problems, including huge corruption, nepotism, and fake democracy.’’ His argument was discussed by Czech academic, a journalist, and the Ambassador of the Czech Republic to the EU as well as debated by other users. Along conversing on the EU political topicalities and the broader socioeconomic tendencies of Europe, ‘’Debating Europe’’ gives quite a lot of attention to social, cultural, and also ethical questions for people to talk through and see different sides of the issue. There have been debates about whether the euthanasia should be legalised across Europe or should all EU states recognise gay adoption. This is significant if we consider that in the more regular debate social and ethical questions are more accounted to the national than European perspective. 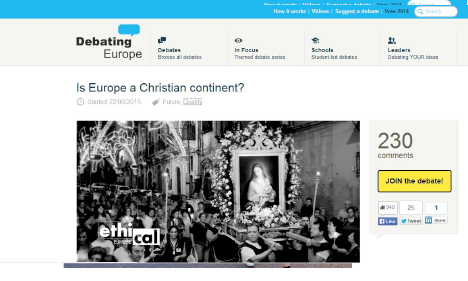 Thus an online platform as ‘’Debating Europe’’ can be one of the few well-equipped channels to discuss these issues. ‘’Debating Europe’’ is a unique platform in Europe and probably even in the wider scale. In regard to Europe it gives a platform to discuss important issues from a starting-point which is unmistakably European as it engages participants from different professions, interests and national positions. But also beyond, online debating platforms can prove to be a tool with increasing importance in today’s democracy.